A spectacular sun-loving flowering shrub or small tree that will be an excellent specimen in the garden if you have the space! Space above for its wide spreading branches and space below for its expanding root system or to ‘soak in’ its fallen debris. A pity we don’t! Our front yard garden is not only mostly paved but too small for this vigorous-growing beauty with brilliantly bicolored blooms of scarlet and yellow, in flamboyant display! Thus, we had to part company reluctantly so to speak, about 2 years ago when it grew to 6 feet tall and as wide. Though stunning and beautiful, it can mess the area around with yellow leaves and spent flowers/stamens/petioles littering onto plants and ground below! Definitely, not suited for our small garden plot! 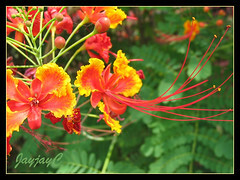 Nonetheless, Peacock Flower is close to my heart and never to be forgotten as my other blog bears its name and has a short post on it too! 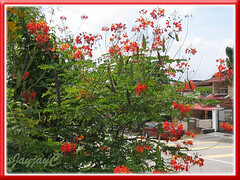 Features: Caesalpinina pulcherrima is a tropical perennial shrub or small tree that can reach 15-20 ft in height, though typically 8-12 ft tall in cultivation. It is evergreen in the warmer tropics, and semi-deciduous to deciduous in sub-tropical regions. A fast-growing bush with low branches in an open and spreading habit, growing as far and wide as its height, sometimes appearing unkempt if not pruned. The trunk and branches are usually armed with thorns. Nevertheless, it is impressive with lovely green foliage, displaying large fern-like or feathery leaves on petioles up to 2 ft long. They are alternate at wide intervals, bipinnately compound with many pinnas bearing simple and smooth obovate leaflets. And, even more stunning are the flowers that it bears plentifully throughout the year in the tropical regions, in single color of red, orange to scarlet, yellow and pink or gorgeously bicolored. The terminal inflorescence held on long and erect stalks are beautifully displayed above the complementary green foliage. Very showy flower clusters…even as the lower and older florets are shed, rounded buds above begin to bloom, showing off its colorful spoon-shaped 5-petaled flowers with crinkly edges and long protruding stamens. This lovely bush starts flowering even when very young. It also produces flat and green seed pods about 3-6 ins long abundantly, emerging along the bottom of the inflorescence that quickly darken to brown when ripe and containing shiny brown flat beans which can be used for propagation. Besides, seeds fallen on ground self-sow readily too. 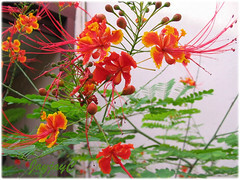 Though C. pulcherrima or the Peacock Flower Tree resembles the Delonix regia (Royal Poinciana or Flamboyant) in many ways, it is much smaller in stature and aptly known by one of its common name, Dwarf Poinciana. 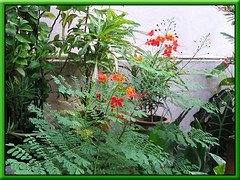 Culture (Care): C. pulcherrima can be easily grown with minimal maintenance in the tropical and sub-tropical countries. Light: Best growth and flowering in full sun, but grows well too in partial shade. Moisture: Medium water requirements, drought tolerant when established and moderately salt tolerant. Soil: Well-drained alkaline to acidic soil, but adaptable to any kind of soil, even sandy and loamy. Others: Prune the bush regularly after flowering to avoid becoming messy or appearing unkempt and straggly. It tolerates hard pruning, so do the needful to shape as a tree or a shrubby bush. Feed with a liquid fertilizer monthly. No serious pests or diseases. For sub-tropical regions: Hardiness: USDA Zone 8-11 with minimum of 21 degrees F. It is not frost-hardy, dies to the ground following frost or freezing temperatures, but returns fine in warmer conditions (late spring) and flowers all through summer and fall. It is winter deciduous, so water and fertilize sparingly in winter. Recommended to prune in late winter or early spring. If necessary, cut to below 30 cm above ground. Propagation: From seeds which germinates easily though faster if scarified and soaked in hot water. Alternatively, allow it to self-sow seedlings on the ground from fallen seeds. Can be propagated from cuttings too. Usage: This ornamental flowering shrub will be perfect as a specimen tree in the garden, screen or informal hedge. Well-suited to be grown in large containers too. Can also be used for tropical landscaping. Plant it to attract bees, butterflies and birds, especially hummingbirds to your garden. 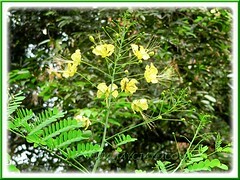 C. pulcherrima is used as a traditional medicine, widely in India, Taiwan and South America, to name a few. The leaves are used as a purgative and the different parts of this herbal plant have been used in common remedies for treatment of a number of disorders including pyrexia, menoxenia, wheezing, bronchitis and malarial infection. It contains numerous compounds such as flavonoids, flavonoid of quercetin and others, extracts of them have been found to possess anti-inflammatory, antiviral and antimicrobial activities. Read more at ScienceDirect and The Journal of Microbial Chemotherapy. 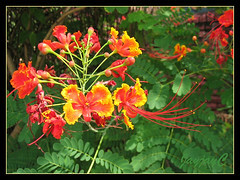 Closely related and bearing somewhat similar features is Caesalpinia gilliesii (Yellow Bird of Paradise) which has yellow flowers with long red stamens. Check it out at Horticulture Unlimited, Inc. I have had a poincina for several years. Did not “feed” it for over a year. I have now been feeding it monthly for almost a year, and it is gorgeous. Question: How often and how deeply should it be pruned? Also, I found a “colony” of tiny ants on it this morning. Is that natural? I have been watering a good deal; my husband says that’s why: watering too much. I water it several times a week; generally for 30 minutes to several hours if I forget to turn it off. I am going to copy the above material for a file. Amd. ot os a beautiful tree. Had only 5 or 6 blossoms last month. I really like the detail u gave about the plant. thank u so much. You’re most welcome! Thanks for your appreciation, Eva! Is this plant (tree), but to have around pets? They eat grass and stuff. Will the fallen flowers or leaves hurt them, if eaten? Sorry, Zima… we have no idea at all about toxicity to pets. I recently moved into a house in Phoenix, AZ. The house that I moved into was a foreclosure and thus had not been lived in for around 2 years. 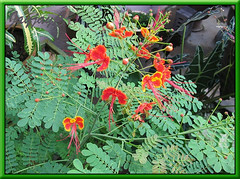 The only plants in the yard were two caesalpinia pulcherrimas which had not received ANY care from the bank for 2 years. Surprisingly they are not dead, but look like they are struggling to hold on. My husband and I are currently watering them every other day to try and bring some life back to them. It doesn’t seem to be working very well. Do you have any suggestions for a way to revive my two red birds? I would so love for them to look as healthy as the plants in the pictures you have posted above! Probably a semi-hard or hard prune (which it can tolerate) will help to rejuvenate your aged shrubs and promote new growth, provided the roots are well established. Or at least trim off the dead twigs and straggly stems or unwanted branches for better light penetration and air movement which will help to reduce stress on the plants. Hope your plants will revive their health and give you much delight! 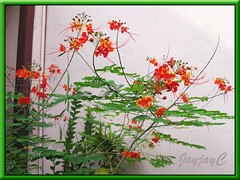 The yellow form with red stamens is not C. pulcherrima, it is Caesalpinia gilliesii. The brilliant scarlet with yellow is the natural, wild-type color of this species. The pink form (“Rosea” also known as ‘Compton’) is basically a non-yellow mutation. The solid yellow variety (‘flava’) is a non-red mutation. And the most recent variety around is ‘Cream’, a combination of non-red and non-yellow. These are the true breeding (when selfed) combinations of the genetics involved. Hope this info helps! All the color forms mentioned above (except for the C. gilliesii) are varieties of C. pulcherrima. I wasn’t clear on that in my post above. Crosses between the four color forms above provide additional flower colors to enjoy, though they will not breed true. I particularly like the cross between the pink and the wild-type red/orange where the intense red/orange color has a decided rose/pink cast. Thank you very much for the additional info, Ron! Very appreciated by us. Thank You for all the details. I plan to grow fifty or more of these . My seedlings are already three weeks old. You’re most welcome, Richard. All the best and may your seedlings flourish and bloom abundantly to delight you. My pink dwarf poinciana has an abundance of small grey flies that are coming out of the soil, and I know that it is recovering from my over watering it, but are the flies bad for it? If so, is there anything I can do about it? Any help would be appreciated, thanks! Try spraying it with organic pesticide 2-3 times a week and see whether this helps, Shanna. I have a question about root system. Are the roots down growing or do they grow sideways?? And can it damage a structure?? Sorry… I’m unsure about its root system, whether it’s downward or sideward growing. What I can remember is that we had this Dwarf Poinciana in our garden bed that’s bordered by concrete and it didn’t damage the concrete border. Hope this helps. Thank you very much. This article was very well writtne and informative.